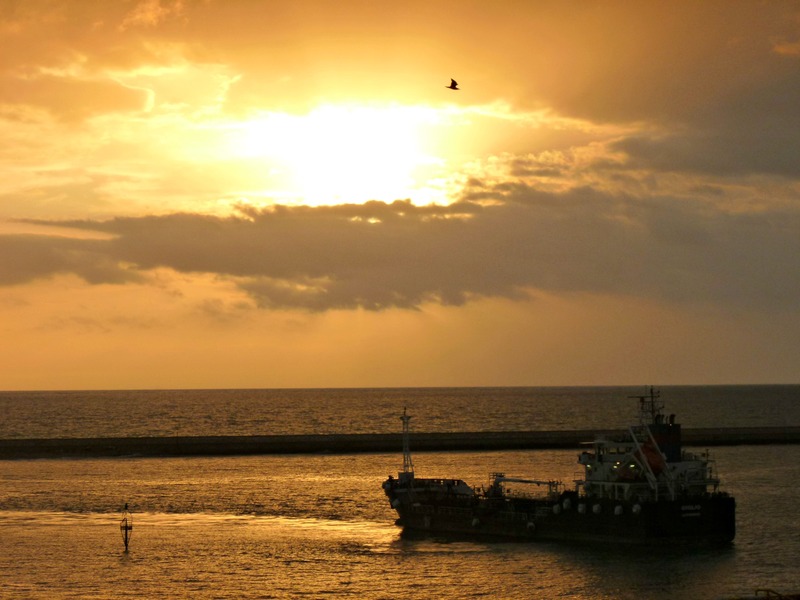 We arrived on day three at the port of Liverno, Italy. 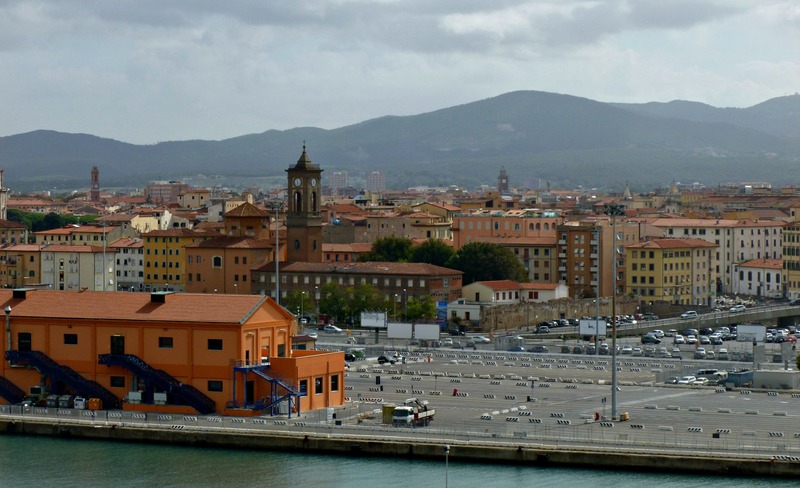 At this port, people had the choice of going either to Florence or Pisa. Since we had been to the lovely city of Florence a few years back, we decided to go see something we hadn’t seen before, Pisa and of course The Leaning Tower. Our tour was scheduled for early afternoon, which was fine. 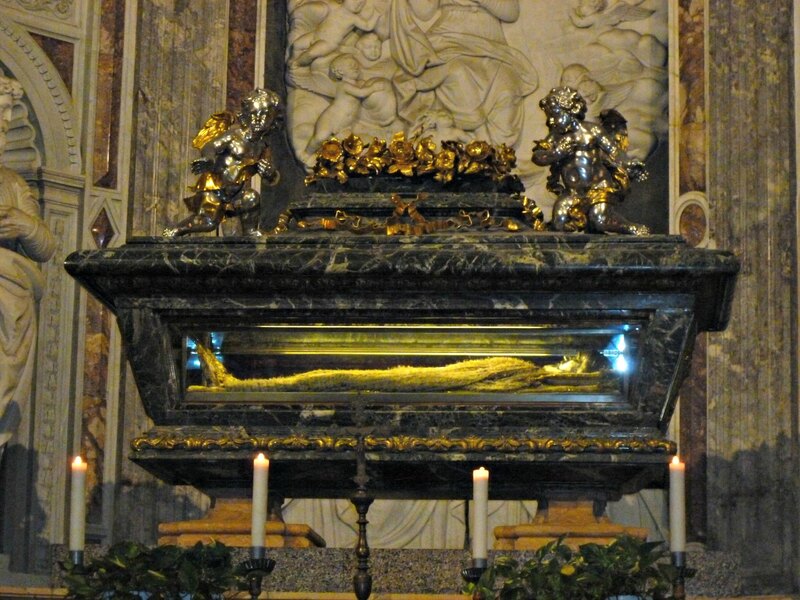 What wasn’t so fine was the news we received the day before concerning our tour in Pisa. After the horribly disappointing NON-stop in Cannes, we were then told that part of the tour of Pisa was cancelled. 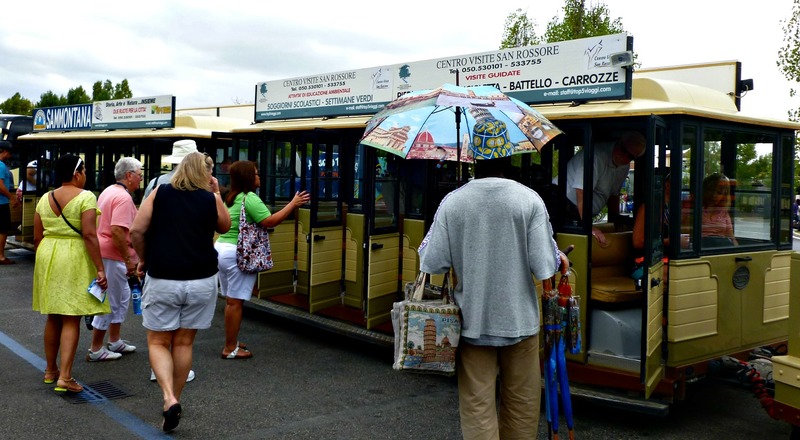 We were supposed to do a tour down the “scenic Arno River”, but apparently the tour boat was broken. No, there was not a replacement boat, we were just out of luck. What can you do? Grin and bear it, I guess. Everywhere we went, we were literally surrounded by fellows (and sometimes ladies) like the guy in the center of this photo, holding the umbrella. They were selling umbrellas/parasols, bags, postcards, you name it! I found that I could be polite and say “no, thank you”, they would walk away approaching someone else…. and then, two minutes later, they’d be back, practically begging us to buy whatever it was they had to sell. I do understand that people need to make a living, but it was a bit annoying. I never felt threatened or anything like that, however. We rode the trolley through the small town of Pisa and ended up at the “Field of Miracles” where the Leaning Tower stands. Doesn’t look like it’s leaning too much in this shot. No worries, it’s just the angle we were viewing it from. It’s still leaning, for sure. No surprise, we decided NOT to climb to the top. We still got some pretty good views from below. 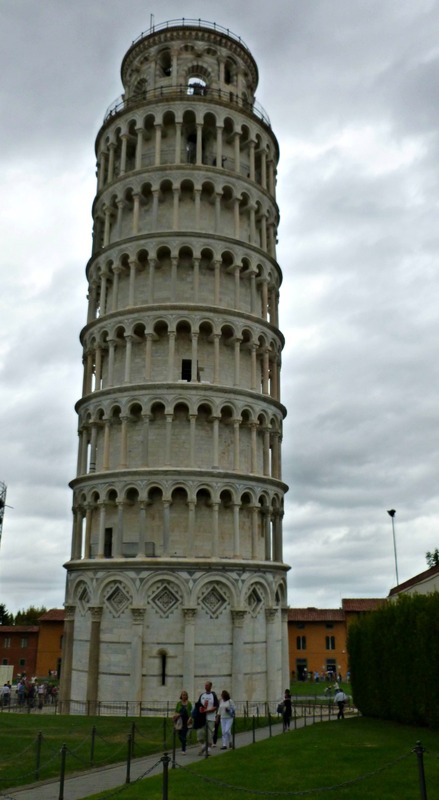 Ahhh yes, here’s the Leaning Tower, actually leaning! 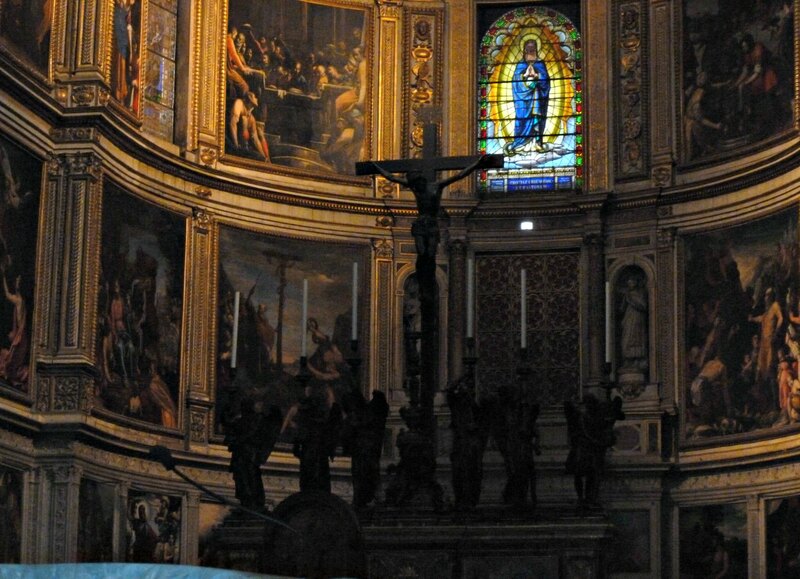 Also in the Field of Miracles is the cathedral and the Baptistry. We did go into the cathedral and here are a couple shots. I had to take a close up of this one. You so often see the crypts of important dead people in these old churches, but it’s rare to come across a see-through crypt. Creepy. Before long, our short tour of Pisa was done. 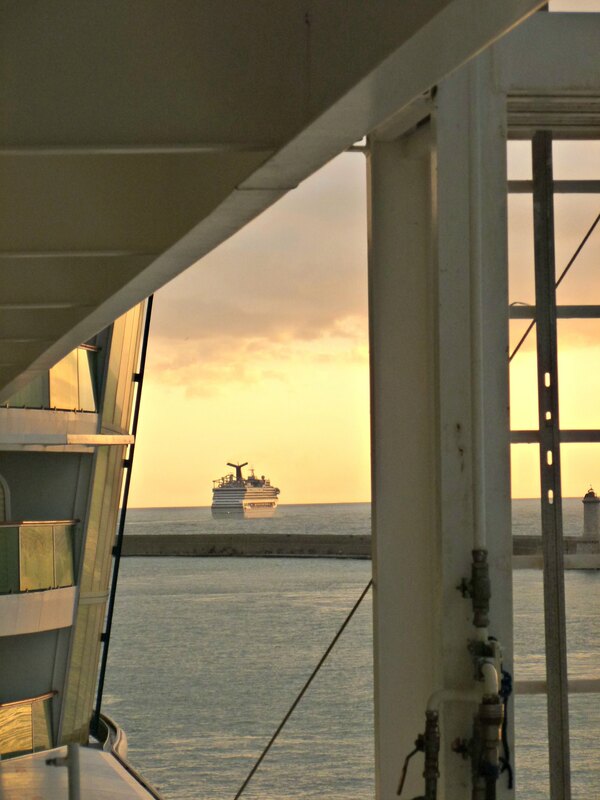 Next thing we knew, we were back aboard the ship, headed out to the Mediterranean once again. I couldn’t resist snapping this shot of another cruise ship, leaving Liverno. As the sun begins to set, we have a bite of dinner (John had lamb chops and I had spaghetti bolognese) and then begin to look forwards to our next stop: Rome. For the first and only time, hubby and I would be doing separate tours. He signed up for the 10.5 hour tour while I did the less strenuous 5 hour tour. This turned out to be a very smart idea. For now, goodnight from somewhere near Liverno! 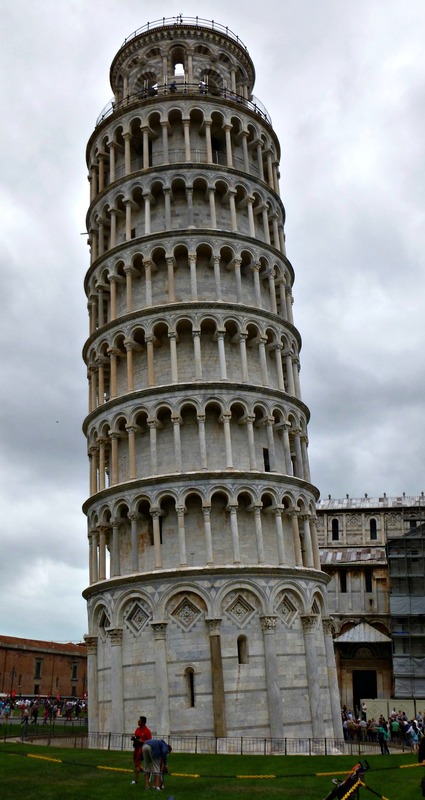 This entry was posted in Travel and tagged Liverno, Mediterranean Cruise, Pisa, The Leaning Tower. Bookmark the permalink.